The over-arching response to the results of these elections appears to be one of shock. The Maldives have been operating as a democracy for a decade after 30 years of dictatorship rule, but the presidency of outgoing leader Abdulla Yameen has been characterised by a shift towards authoritarian rule, and many expected that he would ensure that these elections went in his favour. Mr Yameen – who imposed a state of emergency earlier this year in order to annul a Supreme Court ruling that ordered the release of nine ‘dissidents’ – has been accused of human rights abuses and corruption. According to Azim Zahir, in an op-ed for Aljazeera, Mr Yameen “gradually took control of various institutions … and made them subservient to his political agenda, all the while talking about democracy, rule of law, and development”. Zahir also said that all of Mr Yameen’s major political rivals were imprisoned (on varying charges) or exiled, and he implemented a wide crackdown on dissent, which generated much public anger. Mohamed Junayd (Reuters) reported that there were also concerns about the increase in hardline religious attitudes during Mr Yameen’s presidency. There are, however, various challenges lying ahead for the new leader. 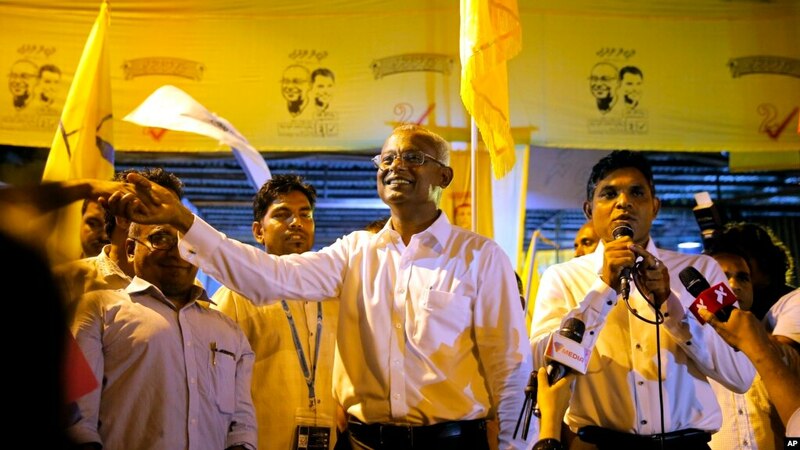 As well as dealing with issues of governmental corruption, Mr Solih ran as the joint candidate for an alliance of opposition parties and now needs to ensure that those parties work together. According to Zahir, the coalition was united by their common enemy – Mr Yameen – but the parties are known to be quick to abandon alliances in order to protect their own self-interests. The Maldives – made up of 26 coral atolls and 1,192 islands – is home to less than half a million people and is known as a popular destination for luxury holidays. It would therefore not seem to have much significance or importance on the international geopolitical stage. However, the US and India have expressed concern about developments in recent years, and, as mentioned above, both welcomed the election results. The island nation, lying 523 kilometres southwest of the southern tip of India, has traditionally fallen into India’s ‘sphere of influence’. After gaining independence from the UK in 1966, the Maldives developed strong bilateral relations with India, which included close strategic, military and economic cooperation. During Mr Yameen’s presidency, however, he moved his country’s allegiances closer to China and Saudi Arabia. He welcomed Chinese funding for major infrastructure projects and signed a free trade agreement with Beijing. In recent years, most of the tourists visiting the Maldives have been from China. International analysts see China’s interest in the Maldives as “part of Beijing’s push to gain strategic influence and carve out new trading routes in the Indian Ocean and beyond” (BBC News). Reuters refers to China’s “String of Pearls” strategy, which involves “developing a network of friendly ports in the region from Sri Lanka to Pakistan”, which would enable China to extend their military reach – something that concerns both India and the West. Unbeknown to many of the tourists who visit the Maldives, there is an ongoing struggle for minority Christians in the Muslim island nation. Former president Maumoon Abdul Gayoom stated that only Islam should be allowed in the Maldives, and the lack of tolerance towards Christians continues today. Public practice of the Christian faith is prohibited, and Christian missionaries have been expelled from the country. Maldivians who convert from Islam reportedly lose their citizenship. According to Open Doors’ World Watch List, which ranks countries according to the level of persecution of Christians, the Maldives is 13th from the top of the list. There is a hope that a new presidency could bring new freedoms in this regard, but this is something that time will tell. It is also hoped that if the Maldives renews their relationship with India, Maldivians who travel there might have more access to the Gospel. Christianity in India is still a minority religion, but the Gospel is able to be shared far more freely there than in the Maldives. Whatever the outcome of the new season of leadership, it is certain that God is working out His plan for the growth of His Kingdom, in the Maldives as well.